Hi i´m a newbie to this forum. 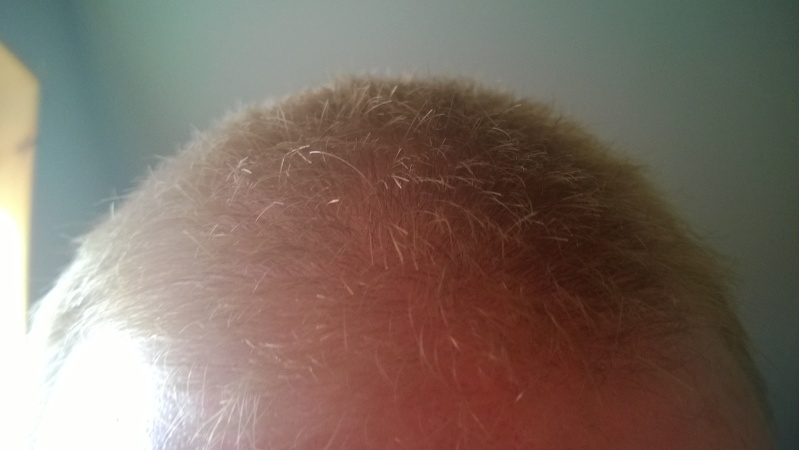 My hair loss started about 15 years ago. 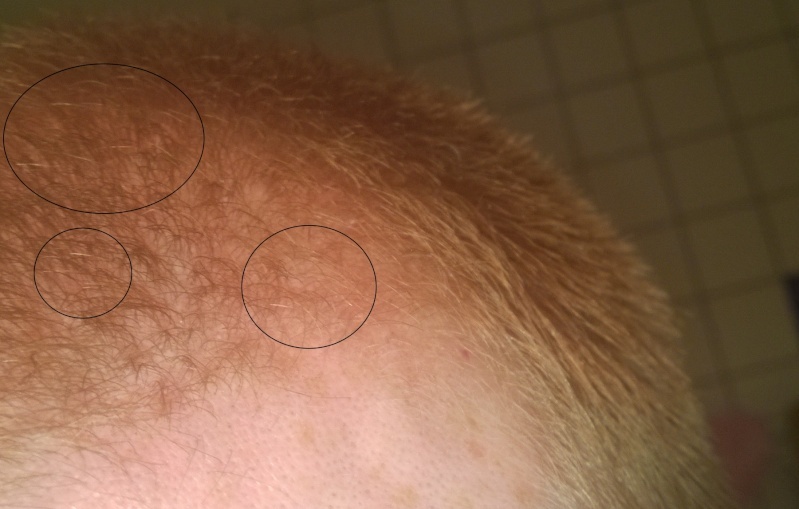 I started using minoxidil 10 years ago, but the side effects got to me and i gave it up since both sides of my parents suffers from hair loss. 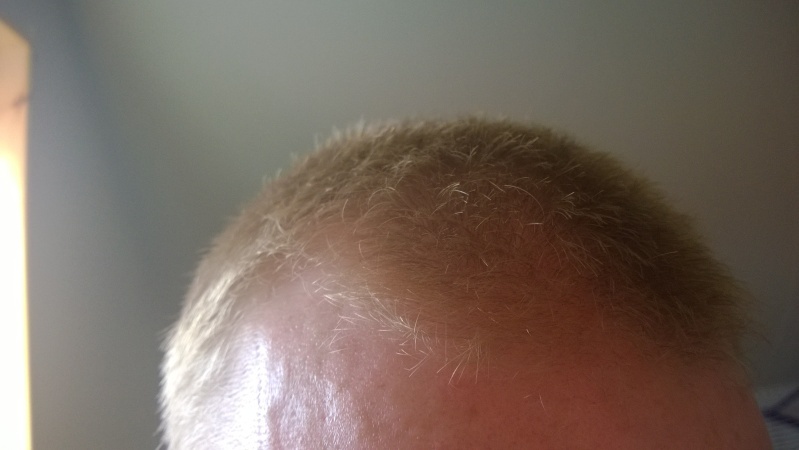 About 8 weeks ago we started slow juicing greens for health beneficial reasons, and after about 4 weeks in my wife noticed strange new blond hair popping out my crown like i had before. I was quiet surprised myself and i couldn't understand why, but then the aha experience came to me due to the juicing. 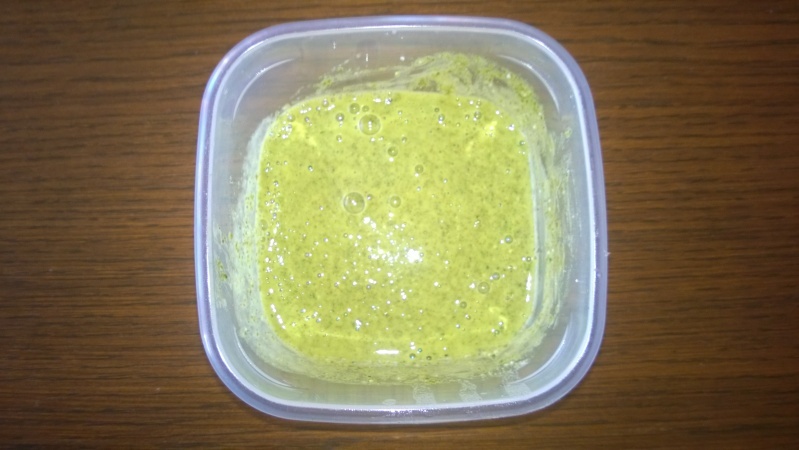 Started reading more regarding greens for hair benefit, and also stumbled in to topical remedy containing green tea, oils and coconut (youtube) and i refined this mixture with fresh coriander and thought why not. 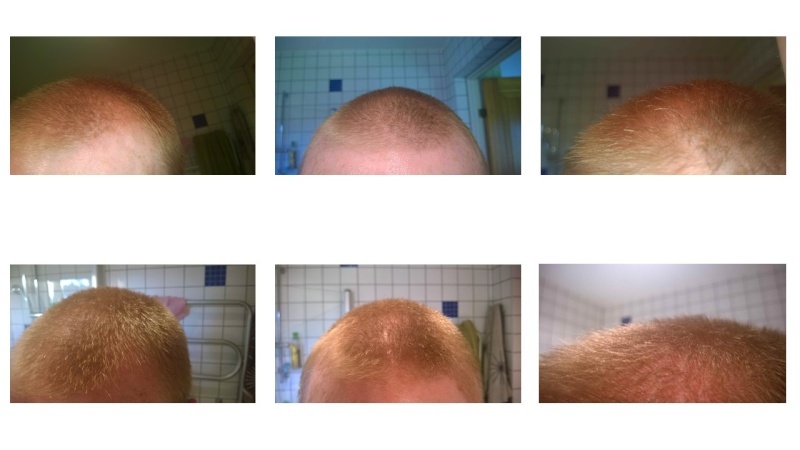 The time between these pictures is only 12 days and new hair is growing rapidly. My sleeping hair was dark but suddenly my youth hair is growing back. I´m not trying to convince anybody, but i was quiet amazed by the results and if somebody are curious what i´m using i´m more than happy to share. 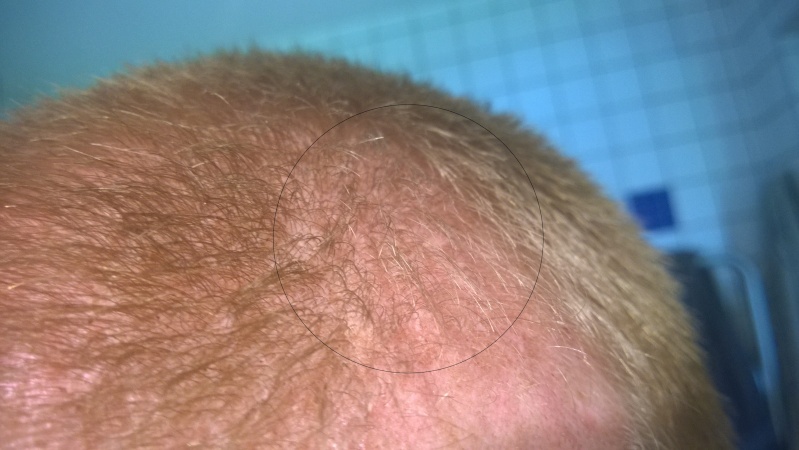 I´m convinced that hair loss is not science, regarding medication to revers hair loss. Interesting,but could you share more details? What are changes to your diet,what are your smoothies made of and how to make the topical with green tea? I was too harsh in my other comment section, regarding that this forum is the same as medical treatments. Read a lot after my sudden hair regrowth and maybe fresh vegges has more to it than we think of. It´s always easier to take our nutrients in a pill form or even as a topical mixed form (with natural ingredients of course), but i think our bodies thinks otherwise. I use a slow juicer and put in celery, cucumber, kale, spinach and coriander and drink it directly because of the enzyme progress (4-5 times a week). Besides that i take 2 tsp of chlorella powder in water two times a day. As topical 2 tsp pure castile soap, coconut milk, castor oil, coconut oil, 1 tsp olive oil and one tea bag of green tea and a pinch of fresh coriander. I leave it i for about 20 minute and just rinse it off (you can use everyday or at least 3-4 times a week). I know it sounds a lot but once you have it´s not a problem and the green juicing is health beneficial also. New pictures are coming at the end of this week if your curious regarding my progress. Do you not use hot water for the green tea? It reacts directly with the oils when you stir them together. It´s a good combination with the castile soap because you can just rinse it off with lukewarm water. Looks nasty green on your head during the 20 minutes that's all. I was really surprised myself of the quick effect since i gave up the thought of hair. 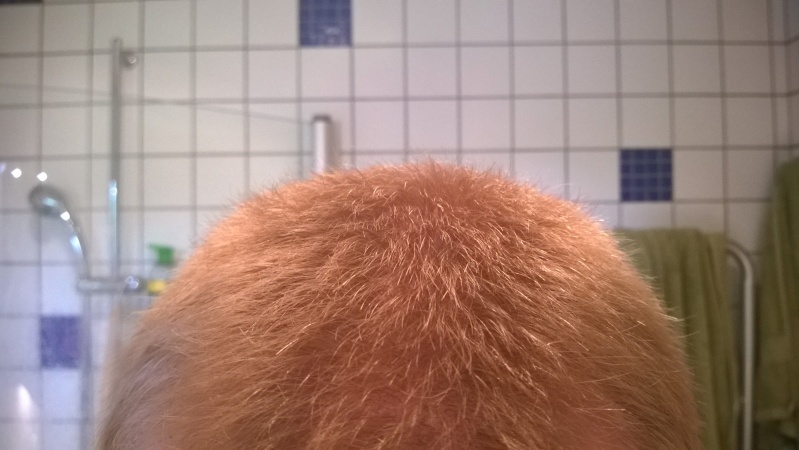 Was at the hairdresser today for the first time since ages, she was quiet shocked when she saw the hair. The funny part is that is the same color i had in my youth, and looks funny blended with my old sleepy hair. It has a strong taste but the lemon takes it away. what kind of juicer do you use is it centrifugal, masticating, or some other type? We use a horizontal masticating juicer with 80 RPM rotation. very nice post, I l really believe that this thing really works. I'm going to give it a try. 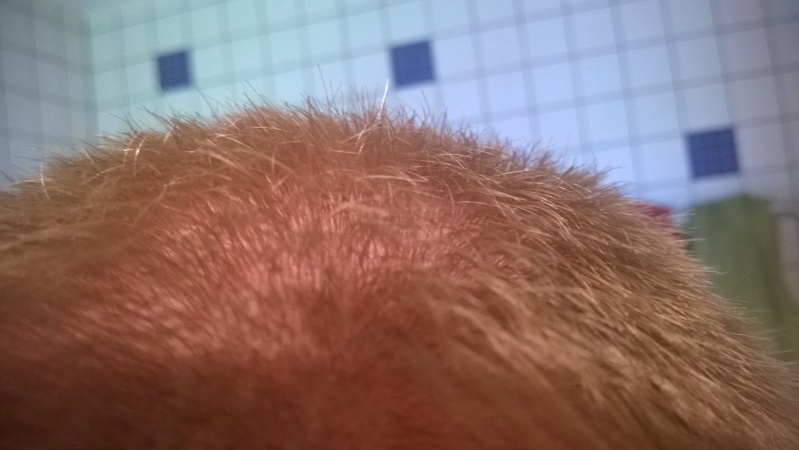 This is 5 days after my hair cut, but the new white hair outgrows the hair cut quickly. My hair is almost full now and new baby hairs are still growing. Next week i´m going to post new pictures from the same angle and light as the first ones. 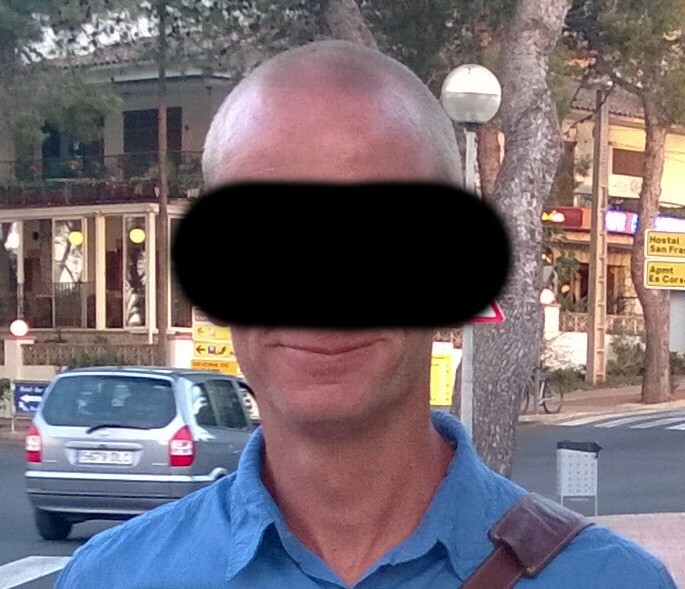 Found an old picture taken last year, for a better comparison with my new ones. 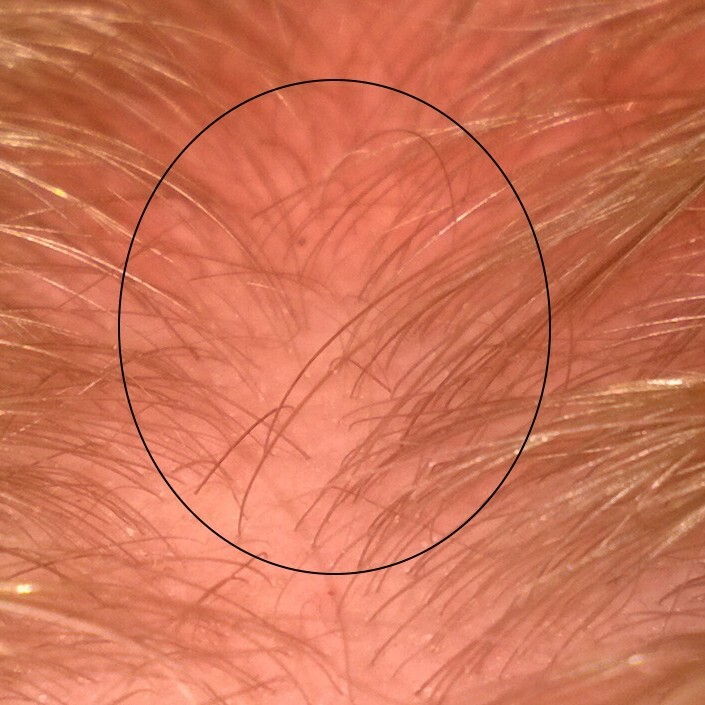 Moisted and splitted my hair on this close up picture since my hair is light blonde, to show that there is still regrowht. some water and thats it? also can you say a little more about the quantity of the ingredients for the juice? do you just throw in one a piece, add some water and mix it, then drink 35cl and keep the rest in the fridge for the next days? i know this probably impossible to answere but what do you think has done more for your hair, the green juice or the topical? Maines wrote: thanks a lot for sharing. will definitely try your method! i've never mixed any juices so im a beginner. you put all the ingredients in the mixer and add some water and thats it? also can you say a little more about the quantity of the ingredients for the juice? do you just throw in one a piece, add some water and mix it, then drink 35cl and keep the rest in the fridge for the next days? I think that the topical does most of the job. Regarding juicing we use a slow masticating juicer, but you can probably use a blender if you add some water. Know i use a pestle instead of a grinder to mix the green tea, and coriander since it becomes even (smoother). The results came fast for me, and of course my hair is a lot longer now so the comparison is harder but as you can see in my old picture, the front area i only had a little dead hair left. 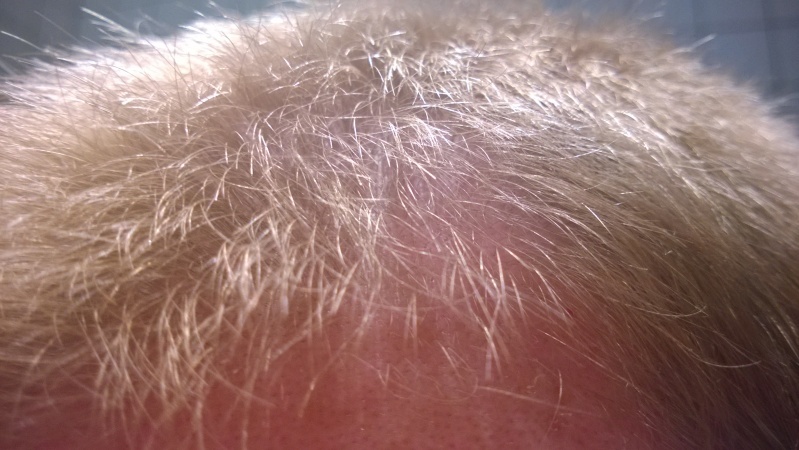 I let it grow since there is still a lot of new hair growing and it thickens the hair volume. Pictures of the nasty paste and how my hair looks now. Forgot to mention about juicing greens. I drink it directly since as soon you brake the greens, the enzyme progress begins. The benefits with a slow masticating juicer is it´s low RPM, and it docent heat up the greens during the progress. Nice progress. When blending plants highest in chlorophyll, lowest in oxalates, I realized the greatest increase in hair volume and some overall hair growth. There are some days where I blend nothing but leafy greens. Those who think 'healthy' smoothies mean eating loads of fruits just have the whole concept entirely wrong. I almost feel bad for the long-term health of their pancreas. 4039 wrote: Nice progress. When blending plants highest in chlorophyll, lowest in oxalates, I realized the greatest increase in hair volume and some overall hair growth. There are some days where I blend nothing but leafy greens. Those who think 'healthy' smoothies mean eating loads of fruits just have the whole concept entirely wrong. I almost feel bad for the long-term health of their pancreas. thanks for the detailed response Sage. I have a blender but right now I'm considering to get a slow juicer. I read that vitamins / minerals might get destroyed using a blender but I wonder if thats neglectable. Slow juicers seem very expensive and time consuming. I mean this is about my health so I dont want to be greedy (neither with money nor time) I just wonder if the difference in quality is neglectable. Does anyone have information on that? regarding the recipe for the juice: are all ingredients choosen because they particularly good for hair or did you just randomly put them together because you had a good feeling about it or have you been experimenting? I once read that wheatgrass can be beneficial for hairgrowth and i think it contains a lot of chlorophyl. Would it make sense to add some of it as well? Maines wrote: thanks for the detailed response Sage. I have a blender but right now I'm considering to get a slow juicer. I read that vitamins / minerals might get destroyed using a blender but I wonder if thats neglectable. Slow juicers seem very expensive and time consuming. I mean this is about my health so I dont want to be greedy (neither with money nor time) I just wonder if the difference in quality is neglectable. Does anyone have information on that? Since we bought the slow juicer we have used it every day, and not time consuming at all actually. We juice in the morning on an empty stomach, and alternate carrots and greens every other day. Sounds boring but we found a very good balance, by drinking juice and oatmeal with a Tbsp of chia seeds and a cup of green tea. Some claim that slow juicers are better, since the outcome is more nutritious due to the slow rotation. Regarding choosing greens it was mainly for health in the beginning, but i also read about greens and hair. You can alternate with the greens: cucumber, celery, spinach and cucumber, celery, kale, coriander for example. I use cucumber and celery as a base and alternate with kale and spinach since they are "heavy". The fibers comes out from the pulp, but fibers i get from whole food instead. Chlorella is more powerful than wheat grass, but i would choose wheat grass if it was fresh to juice it instead. I use the powder instead of pills since you need 6-10 pills to gain the same nutrition as 2 tsp of powder. The progress looks good...but...your hair is also longer and may covering up some bald areas. 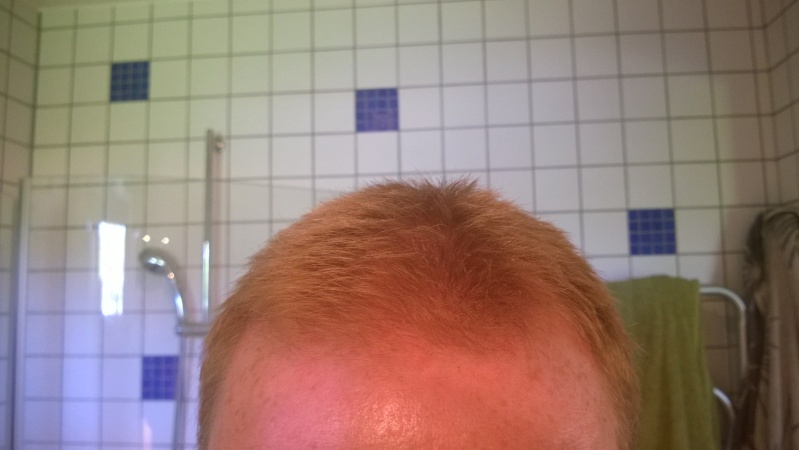 Can you cut your hair short like it was in the original pics and take a pic from a higher angle instead of straight on? shaftless wrote: The progress looks good...but...your hair is also longer and may covering up some bald areas. Can you cut your hair short like it was in the original pics and take a pic from a higher angle instead of straight on? 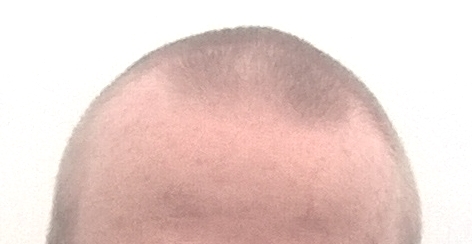 This was more of a fluke since i accepted my hair loss. Like posted earlier i was surprised by the result, and with too much free time made me experiment more. For me at least this works really good, and i still see new hair growing. 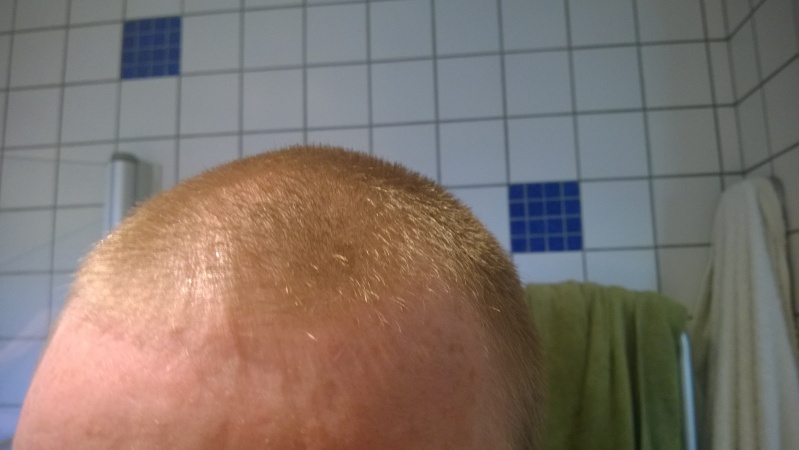 I´m not allowed to shave my head, since my wife suddenly became shallow when she discovered my regrowth. Hopefully these pics helps a little. Forget about your hair volume, which has improved, but your overall hair health has improved as well. Good job dude.